On August 23, Disney’s Hollywood Studios® held a special one-night event, “Villains Unleashed,” that turned the spotlight to the scoundrels of Disney’s famous films. Villainous characters included Cruella De Vil from Walt Disney’s 101 Dalmatians, the Evil Queen from Walt Disney’s Snow White and Seven Dwarfs, Maleficent from Walt Disney’s Sleeping Beauty and Hades from Disney’s Hercules. Guests were invited to dress like their favorite villain and enjoy specialty drinks and treats. 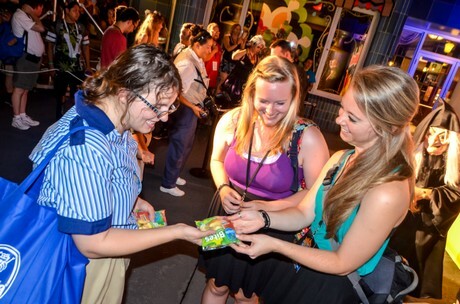 The guests who stopped by to see the Evil Queen from Disney Snow White and the Seven Dwarfs received a special treat. In the story, the Evil Queen, disguised as an old beggar, gives Snow White a poison apple that causes her to fall into a deep sleep. However, event guests had better luck! They received healthy, delicious Chiquita Apple Bites that gave them energy for the rest of the evening! The event concluded with an impressive fireworks display. Chiquita is proud to have an alliance relationship with Walt Disney World® Resort and Disney Cruise Line and is the exclusive supplier of branded bananas and salads within the resort and cruise ships. Chiquita also sponsors two attractions: “Crush ‘n’ Gusher Water Thrill Ride,” themed to a tropical fruit processing center at Disney’s Typhoon Lagoon Water Park and “Living with the Land,” an Epcot® attraction that takes guests into The Land Pavilion’s greenhouses to explore advances in agriculture. Chiquita also takes part in runDisney events by providing healthy snacks and promoting the benefits of a healthy and active lifestyle.